Selling ice cream is a great summer business that can also be profitable all year round. While ice cream businesses are typically brick and mortar, a mobile ice cream stand is less expensive to start and can bring you to a wider range of clients in more locations. Many people sell items, including ice cream, from stationary stands on the street and make a decent profit for the summer. However, being mobile provides added benefits. 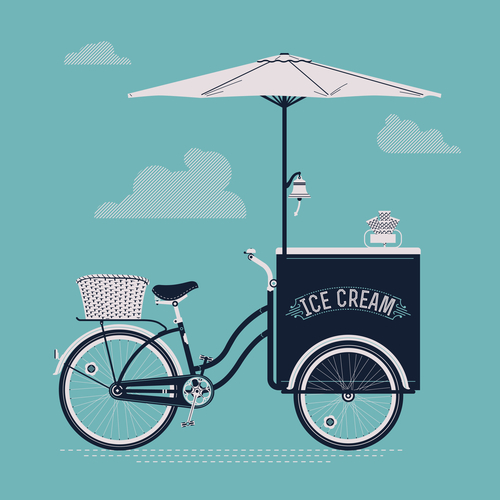 With an ice cream bike cart, you can easily reach more customers overall. Having a mobile option allows the business owner to save time because you can cover a greater distance when compared to walking or remaining stationary. Additionally, since more distance is covered, you can reach more people who may want to buy ice cream, therefore resulting in additional profits. It is possible to run an ice cream business in a truck as well. However, using a truck for business can result in needing a special type of license to drive it. Truck owners may find they even need additional licenses to operate the trucks. Trucks aren’t able to fit on sidewalks and in smaller spaces, which is not an issue with an ice cream bike cart. Additionally, the cost of buying the bike cart is much lower when compared to other means of transportation! Maintaining a bike cart is much easier than using other forms of transportation and costs less as well because parts are significantly cheaper if they need to be repaired or replaced. Ice cream bike carts can also be customized to specification and have a wide variety of designs and colors from which to choose. The costs required to keep this customization and cart looking like new are quite affordable as well. If you are looking to buy an ice cream cart for your business, contact us to find out more.